Coming fresh on the heels of the news that scientists are successfully 3D printing live, working, mini human kidneys, a new report in Nature is giving another burst of hope to the future of organ transplants. For the very first time, a research team has been able to grow human heart tissue that beats totally autonomously in its petri dish home. The tissue itself came from induced pluripotent stem cells (iPSCs), which started as mature human skin cells and effectively "reprogrammed" back to an embryonic state and then coaxed into becoming the desired cell, in this case those with the potential to become heart tissue or multipotential cardiovascular progenitor (MCP) cells. This is the same method that scientists recently used for the far less practical, far more nausea-inducing feat of growing human teeth from urine. This process makes MCPs, which are precursor cells that can further differentiate into three kinds of cells the heart uses, including cardiomyocytes, endothelial cells, and smooth muscle cells. Nobody has tried using these MCPs for heart regeneration before. It turns out that the heart's extracellular matrix – the material that is the substrate of heart scaffold – can send signals to guide the MCPs into becoming the specialized cells that are needed for proper heart function. 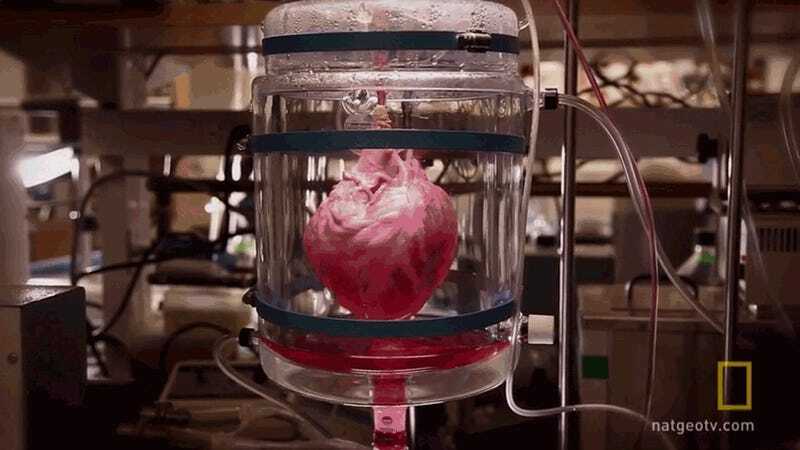 After several weeks, not only had the mouse's heart been fully rebuilt with the human cells, it was also beating again entirely on its own at a rate of 40 to 50 beats per minute. While this is certainly an incredible achievement the heart still isn't quite at the level of effectively being able to pump blood throughout a human body—the average resting human heart rate is 60 to 100 beats per minute.